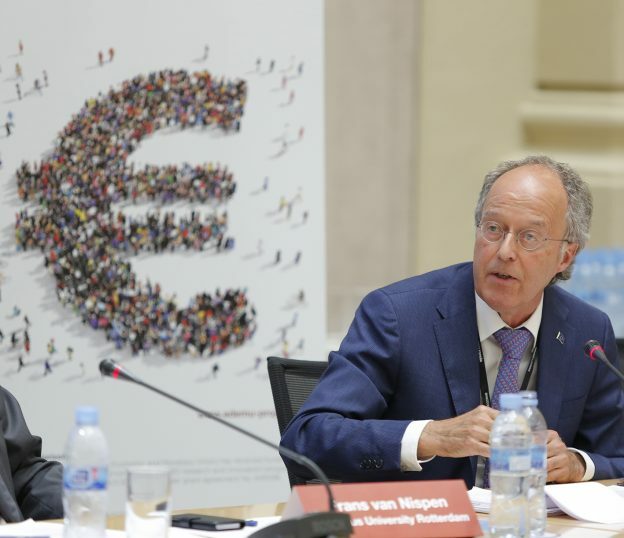 Emerging from the crisis, major challenges remain says René Smits, Professor of Law of the Economic and Monetary Union at the University of Amsterdam and member of the ADEMU Advisory Committee. Emerging from the deepest crisis in its history, the European Union (EU) faces multiple challenges. The economic crisis has abated and instruments have been introduced to prevent another systemic crisis, or to overcome it when it does erupt (assuming, of course, that past weaknesses thus addressed will cause the next crisis) while new crises hardly ever erupt from the same sources as the last one. Institutional strengthening has taken place, including banking union and the introduction of the European Stability Mechanism (ESM). Case law of the Court of Justice of the European Union (CJEU) has underscored the compatibility of crisis fighting measures with Union law, even for unconventional central bank measures and mechanisms outside the confines of Union law, with a slight opening for judicial review of the strict conditionality measures imposed in consideration for financial assistance to Member States in deep financial stress. Major challenges remain, both for the Union at large and for Economic and Monetary Union (EMU). Looking beyond Brexit – a uniquely English ‘solution’ to the already singularly exceptional Union membership of the United Kingdom (UK) (which only indirectly affects EMU as the UK has a permanent opt-out from adopting the single currency), the most pressing challenges I see for the Union concern migration; the transition to a CO2-free economy; the challenges of rapid technological change, happening with increasing velocity; the restoration of trust between citizens and governance; and the imperative to move towards a more compassionate society. Of particular relevance for EMU, I note that for the following challenges solutions have been brought up. In its current set-up, the ESM is an intergovernmental body outside the EU law proper, making use of institutions of the Union (Commission, ECB). Its decision-making, with national parliaments insisting on a veto for disbursements of funds, pits creditor States against debtor States and makes truly European decision-taking harder to achieve. In his State of the Union address on 13 September 2017, Commission President Jean-Claude Juncker announced a proposal to transform the ESM into a European Monetary Fund, anchored in the framework of Union law, on the basis of Article 352 TFEU. Article 352 allows the EU to take measures by unanimity if action is necessary in the context of policies already covered by the Treaties, but for which they do not provide the necessary powers. Thus, without granting the three Union institutions involved true ‘Kompetenz-kompetenz’ (the power to define their own powers), this provision permits the adoption of “measures” that are “necessary” in policy areas that are already within the EU sphere of competence. Bringing the ESM under the Union umbrella will also ensure that the Memoranda of Understanding (MoUs) it concludes with debtor States become Union law and will be accessible for judicial review without more, as the Commission’s MoU with Romania (a State outside the EA) was considered to be. This is currently not the case with MoUs with EA States. Even though the actual results of judicial scrutiny of austerity measures adopted in the context of financial assistance may not be great – due to judicial deference to the discretion of Union institutions and the leeway for national governments in translating conditionality commitments into actual austerity measures, putting EA citizens on the same footing as those of States outside the currency union would correct a current anomaly and inequality before the law. It is another inequality, namely in their exposure to the strictness of economic policy measures agreed at EU level, that undermines trust between Europe and its citizens. Dutch and German citizens are hardly affected by economic policy prescriptions emanating from Brussels, whereas Portuguese and Greek citizens do feel their impact. An EMU worthy of its name ensures that economic policy implementation is effective across the Euro Area, as much as the single monetary policy should be. In his farewell paper as German Minister of Finance, Wolfgang Schäuble, made suggestions on the ESM which go in the opposite direction to that proposed by Juncker. Schäuble suggests to put the ESM in charge of monitoring ‘country risk’ and to ultimately endow it with the Commission’s powers of oversight of the Stability and Growth Pact (SGP). His view implies intergovernmentalism and continuation of a rules-based adversarial system of economic governance for the Eurozone, a direction Europe should not take. The announced insertion of the TSCG, as the Fiscal Compact Treaty is known, into the TFEU is welcome and worrisome at the same time. Welcome, since insertion into TFEU will make the economic governance framework of EMU more communautaire and less intergovernmental, like the transformation of the ESM into a Union body. Article 126(14) TFEU provides the necessary legal basis. Worrisome, since the TSCG – while hardly adding substance to the measures already adopted in the ‘six-pack’ legislation on strengthening economic governance – is the expression of a rule-based bias in EMU. Rules relating to sound budgetary policies are welcome and should continue to have their place in a sustainable EMU. Yet, over-reliance on rule enforcement makes Union economic policy-setting adversarial in nature, pitting the Union against Member States; it delegitimises national policy making, so is in need of stronger input from the European Parliament than currently is provided for; and it results in inadequate discretion for economic policy makers: we need an EA policy stance, and alignment of national budgetary policies along these lines, rather than observance of restrictive rules. The Commission’s further explanation that integration of the TSCG into the TFEU will be proposed “taking into account the flexibility built into the Stability and Growth Pack by the European Commission since January 2015” is reassuring but not sufficient to allay my concerns on over-reliance on rules. Economic policy discretion requires budgetary powers. Economic policy is more than budgets; it includes nudging the economy towards sustainability and a carbon-free future; fostering private investments; effectively enforcing competition policy; promoting regional development; regulating utilities or what these have become after the privatisation of energy, rail, post and telecommunication providers. Aligning national budgetary policies has not proven very successful, except for governments shut off from markets for outside financing: these are forced to follow federal policy prescriptions. These same markets hardly fulfilled their function of disciplining governments before the crisis, and overreacted since, effectively banning sovereigns from the marketplace. The pleas for a Euro Area budget are welcome and overdue. Whether this is an EA budget separate from the Union budget, or budget lines in the EU budget does not matter economically although, institutionally, it does. President Juncker’s suggestion to seek to restore the overlap of the EU and the EA, by ensuring sufficient convergence among the States currently outside the currency union so that they may enter in the next decade, would argue for employing the EU budget. Own resources should be added that are truly ‘Union-ised’: levies directly flowing into Brussels coffers, subject to consent by and scrutiny of the European Parliament on both income and spending. Ensuring a measure of automatic stability into the EA through partial funding of national unemployment schemes seems an area to be further explored. An ADEMU Project study concluded that the ability to provide inter-regional smoothing is core to such a scheme. The common budget for the EA should assist in steering the economy to sustainability and climate-change friendliness. Relative low amounts of expenditure may have leverage effects, as with the European Fund for Strategic Investments (EFSI). Management of the budget should be attributed to an EA Minister of Finance. A few considerations of an institutional nature on the Eurozone Minister of Finance: this function should be executed at the European Commission as President Juncker proposed in his September 2017 STOU address. The roles of Chair of the Eurogroup and Vice-President of the Commission for Economic and Financial Affairs (and of President of the European Monetary Fund?) could combine to introduce a top political executive, accountable to the European Parliament. The executive would act as counterpart to the Single Resolution Board (SRB), the ECB and ESMA, be responsible for the ESM and ensure transparent and efficient execution of the budget line(s) for the Euro Area in the EU budget. Once a European Deposit Insurance System (EDIS) has been introduced, responsibility for its activation would rest with the SRB, who should account to the EA Minister of Finance also for this part of its functioning, as it is now already accountable to the European Parliament, the Commission and the Council. Long overdue, the EA should be represented at the IMF and in G7 meetings in a unified manner. The Commission’s proposal for unified representation at the IMF would see the President of the Eurogroup as the EA’s ‘man (woman) in Washington’. Only if the recently suggested combination of the functions of President of the Eurogroup and Vice-President of the Commission were to be realised is this proposal institutionally acceptable. Proper channels of accountability should bind the Eurozone’s representative at the IMF – a requirement which the Chair of an informal body such as the Eurogroup does not fulfil. The Commission alongside the ECB should represent the EA at the IMF just as, at national level, Ministers of Finance and central banks represent the IMF’s members. Beyond the proposed solutions on the institutional plane, French President Emmanuel Macron presented a clear overall vision for the European Union and the Euro Area. His encompassing view includes elements of institutional reform for the EMU, including “a budget allowing [the EU] to fund common investments and ensure stabilization in the event of economic shocks”. Macron’s ideas partially build on what has already been achieved and may go beyond the immediately attainable – this does nothing to diminish his ‘prophesies’, since ideals and prophets are needed to help us shape our future. Painting horizons, rather than drawing red lines is exactly what Europe is in need of now. Fusing French ideas and German insistence – such as the legitimate requests for regulatory treatment of sovereign bonds and the introduction of a sovereign debt restructuring mechanism at EA level – should combine to work on institutional solutions that deliver concretely, on the ground, for the citizens and enterprises of Europe. Increased capital, liquidity and risk management requirements, part of an overall much strengthened regime of standards for the financial sector, agreed globally – notably in the context of the Financial Stability Board (FSB) and the Basle Committee on Banking Supervision (BCBS) – and implemented in Europe through the Single Rulebook, i.e. the regulations and directives on banking supervision. Beginning with the introduction of the European Systemic Risk Board (ESRB) in 2010. Prior to banking union, in 2011, the European System of Financial Supervision (ESFS) became operational, with the European Banking Authority (EBA), European Securities and Markets Authority (ESMA) and European Insurance and Occupational Pensions Authority (EIOPA) harmonising standards for prudential and conduct of business supervision across the financial sector in the entire EU, even for the European Economic Area (EEA). Under ‘banking union’, the European Central Bank (ECB) and the Single Resolution Board (SRB) effectively steer the Single Supervisory Mechanism (SSM) for prudential supervision of the banks in the Euro Area (EA), as of 14 November 2014, and the Single Resolution Mechanism (SRM) for the orderly resolution of EA banks, as of 1 January 2016, respectively. On the weak points of banking union, see Thomas F. Cooley’s contribution in ADEMU Perspectives # 7. Judgment of 16 June 2015 in Case C-62/14 (Peter Gauweiler and Others v Deutscher Bundestag); ECLI:EU:C:2015:400. A new case concerning the limits of the ECB’s mandate is currently before the CJEU: Case Case C-493/17 (Weiss and Others). See Press Release No. 70/2017 of 15 August 2017 of the German Constitutional Court Proceedings on the European Central Bank’s Expanded Asset Purchase Programme are Stayed: Referral to the Court of Justice of the European Union; and its Order of 18 July 2017 (2 BvR 859/15, 2 BvR 980/16, 2 BvR 2006/15, 2 BvR 1651/15) (partially translated in English below the Press Release). Judgment of 27 November 2012 in Case C‑370/12 (Pringle); ECLI:EU:C:2012:756. Joined Cases C-8/15 P to C-10/15 P (Ledra Advertising Ltd and Others v European Commission and European Central Bank), judgment of 20 September 2016; ECLI:EU:C:2016:701. The UK’s Opt-outs under its present membership status concern: Opt-out from the single currency (together with Denmark; other States are legally bound to adopt the euro complying with the convergence criteria): Protocol No. 15; Opt-out from the Schengen border-free travel arrangements (together with Ireland): Article 67(2) TFEU and Protocols No. 19 and 20; Opt-out from the Area of freedom, security and justice (together with Ireland, Denmark): Articles 67-89 TFEU and Protocol No. 21; Clarification of the application of Charter of Fundamental Rights of the European Union (together with Poland): Protocol No. 30; cessation of application as from 1 December 2014 of “a large majority of EU acts and provisions in the field of police cooperation and judicial cooperation in criminal matters adopted before entry into force of Lisbon Treaty while choosing to continue to participate in 35 of them” (quote from the European Commission’s Press Release IP/14/2266): Article 10(4) and (5) of Protocol No. 36. Focusing on institutional challenges in the context of EMU. President Jean-Claude Juncker’s State of the Union Address 2017, at: https://ec.europa.eu/commission/state-union-2017_en. See, also, President Juncker’s State of the Union Address 2017 – Proposals for the future of Europe that can be implemented on the basis of the Lisbon Treaty, and his Letter of Intent to European Parliament President Antonio Tajani and Prime Minister Jüri Rajas of Estonia which holds the rotating Council Presidency. The Council, acting unanimously on a proposal from the Commission and after obtaining the consent of the European Parliament. The ECB would seem to have to be consulted; its advisory role would seem implied as the ECB has acted as one of the arms of the ESM since its inception as part of its ‘troika’ role, and since the name of the new entity suggests it will assume roles currently undertaken by the International Monetary Fund (IMF) and, thus, act in the monetary sphere. Consultation of the ECB is required “on any proposed Union act within its fields of competence” (Article 127(4) TFEU). Paragraphs 35 and 36 of the judgment of 13 June 2017 in Case C‑258/14 (Eugenia Florescu); ECLI:EU:C:2017:448. On scrutiny of conditionality for respecting human rights, see: Roderic O’Gorman, The Failure of the Troika to Measure the Impact of the Economic Adjustment Programmes on the Vulnerable (2017) 44 Legal Issues of Economic Integration, Issue 3, pp. 265–291; Anastasia Poulou, Financial Assistance Conditionality and Human Rights Protection: What is the Role of the EU Charter of Fundamental Rights?, Common Market Law Review 54: 991–1026, 2017. Insightful comments on the Ledra judgment and the judgment of 20 September 2016 in Joined Cases C-105/15 P to C-109/15 P (Mallis); ECLI:EU:C:2016:702 were made by René Repassi, Judicial protection against austerity measures in the euro area: Ledra and Mallis, Common Market Law Review 54: 1123–1156, 2017. The author draws a comparison between austerity measures deriving from MoUs and Union legal acts, and the effects of a directive (an EU legal act that requires transposition into national law in order to affect citizens and companies). Acknowledging the difference between economic policies (plural and still dominantly steered by Member States) and monetary policy (singular and single for the entire EA) pursuant to Articles 2(3); 5; 119-126 and 136 TFEU, on the one hand, and Articles 3(1)(c) and (2); 119(2); 127-133; 138; 140 and 219 TFEU, on the other. Non-paper for paving the way towards a Stability Union, submitted by Wolfgang Schäuble to the Eurogroup as his final contribution before taking up a new role of Speaker of the Bundestag meeting of 9 October 2017. Treaty on Stability, Coordination and Governance in the economic and monetary union, 2 March 2012. Article 13 TSCG leaves parliamentary input to be determined by the European and national parliaments and relegates this input to “discuss budgetary policies”, rather than (co-)determine them. In my contribution to Democracy in the EMU in the Aftermath of the Crisis, I noted the adversarial approach and the lack of sufficient discretionary room for EA policy-making in the face of actual challenges as a result of too much reliance on rules in economic policy setting. Commission Interpretative Communication Making the best use of the flexibility within the existing rules of the Stability and Growth Pact, 10 February 2015, replacing a 13 January 2015 version; COM(2015) 12 final/2. French President Emmanuel Macron calls for a “un contrôle parlementaire exigent au niveau européen”; see the references to his initiative for Europe speech below. The idea was rebuffed in Wolfgang Schäuble’s proposals; see the ‘Non-paper for paving the way towards a Stability Union’, which states: “A macroeconomic stabilization function e.g. through a new fiscal capacity or unemployment insurance is economically not necessary for a stable monetary union”. See: Mathias Dolls, Clemens Fuest, Dirk Neumann, Andreas Peichl, An Unemployment Insurance Scheme for the Euro Area? A Comparison of Different Alternatives using Micro Data, December 2016; WP 2016/048. President Juncker also proposed to merge the functions of European Council President and Commission President, an institutional innovation that would streamline governance and answer the question “Who to call?” when addressing the EU in times of crisis. The current situation in which Jeroen Dijsselbloem continues as President of the Eurogroup until the end of his mandate while stepping down as Dutch Minister of Finance once the new coalition government – which does not include his PvdA [Labour] party – has taken over shows that the Eurogroup does not have to be chaired by a national minister. See his remarks at the end of the Eurogroup meeting of 9 October 2017. Proposal for a Council decision laying down measures in view of progressively establishing unified representation of the euro area in the International Monetary Fund, 21 October 2015; COM(2015) 603 final. Initiative pour l’Europe – Discours d’Emmanuel Macron pour une Europe souveraine, unie, démocratique, Paris, 26 September 2017. A summary of Emmanuel Macron’s proposals in English and French is available at the website of the Élysée: Initiative for Europe A sovereign, united, democratic Europe. “(…) the ESM mandate should include a predictable debt restructuring mechanism to ensure fair burden-sharing between the ESM and private creditors”: Wolfgang Schäuble’s farewell non-paper. Regulating banks’ exposure to sovereign bonds is another theme broached by this document. This entry was posted in Perspectives on October 25, 2017 by ADEMU.